Shanghai City Guide. China Travel Services. CTS. Los Angeles. San Francisco. Shanghai, whose name literally means "on the sea", is one of the world's largest seaports and one of China’s major industrial and commercial centers. It is located on the east coast of China near where the Yangtze River empties into the East China Sea. Shanghai is also China’s most populous urban area with 11 million inhabitants. Held September 21-27, this festival features a large-scale colorful parade with floats, open-air concerts, Sino-foreign exchanges in tea-related culture, an international symposium on tourism, and an Art & Culture Show at the Red Chamber. Food and shopping are also enjoyed during the festival. The Senior Citizens' Jazz Band, which performs every night in the bar at the historic Peace Hotel, is composed of veteran musicians with more than a half century's experience. Tourists will enjoy a nostalgic evening listening to sentimental favorites. Shanghai is home to China’s most famous acrobatic troupe, and nightly performances are held in a modern, well-equipped theatre. You’ll be delighted by the colorful costumes and light show, while being entertained by amazing feats of balance and agility. Grand View Garden, situated by Dingshan Lake in Qingpu County, is patterned after the settings in “A Dream of Red Mansions”, a classic Chinese novel by the Qing-dynasty author Cao Xuqing. The magnitude of imperial palaces is blended in perfect harmony with the graceful and elegant style of southern China. The Huangpu River flows through downtown Shanghai for a distance of 39 kilometers, separating Pudong Island from Old Shanghai. A cruise on the river will give you excellent views of The Bund on one side and Pudong New Development area on the other. Nanjing Road is the busiest shopping area in Shanghai. A total of 350 stores line both sides of this five-kilometer-long street which sees one million shoppers daily. Some of the city's largest stores are situated here, not to mention various specialty shops and entertainment facilities. Food lovers will also enjoy the street’s many restaurants, featuring all types of Chinese culinary styles as well as foods from around the world. The Bund, a roadway stretching for approximately 1.5 kilometers along the Huangpu River from Waibaidu Bridge in the north to Jinling Road East in the south, is the emblem of Shanghai. On the western side of the Bund overlooking the river are high-rises built in the European architectural style popular in the early part of the 20th century. The eastern side of the Bund is a famous promenade enjoyed by local residents and tourists alike, perfect for people watching. The 7,658‑meter‑long Yangpu Bridge and 8,346‑meter‑long Nanpu Bridge were built only recently to connect downtown Shanghai with the Pudong New Development Zone. Both are double cable‑stayed suspension bridges with a long span. Both feature pedestrian walks and elevators for sightseers. Located in central Shanghai, Yuyuan Garden was first built in 1559 during the Ming Dynasty. Although small in size, the garden’s ingenious layout offers scenic vistas around every corner, making optimum use of the key elements of classical Chinese garden design: rocks and water, trees and pavilions. Surrounding the garden is a shopping Bazaar with many small shops specializing in antiques and curios, teas and teapots, Chinese medicine, and fun souvenirs. One of the highest towers in the world, the 468-meter Oriental Pearl TV Tower, easily visible from The Bund, is a symbol of the Pudong New Development area. Tourists can get a birds-eye view of the city from the observation deck. Shanghai’s Temple of the Jade Buddha is a well-preserved Zen Buddhist monastery which was built in 1882. It is renowned for its statue of the Buddha carved from a single piece of white jade. The statue, which is 1.9 meters tall and 1.34 meters wide, sits cross-legged with a serene look on his face. Dr. Sun Yat‑sen and his wife Soong Ching-ling lived in this building at 7 Xiangshan Road from 1918 until the end of 1924. Downstairs are the parlour and dining room, and upstairs are the bedrooms and sitting rooms. The furniture is arranged according to Soong Ching‑ling's recollections, and most of the objects on display are originals. Considered by many to be the finest museum in China, the Shanghai Museum’s collections include 120,000 pieces displayed in 21 departments. Especially known for its bronzes, ceramics, paintings and calligraphy, the museum also features jade and ivory carvings, bamboo and wood articles, lacquerware, royal seals, furniture, ethnic minority costumes and handicrafts, amongst others. The museum gift store has an extensive array of art books along with replicas of ancient bronze vessels and pottery objects, and reproductions of famous paintings and calligraphy. Chinese cuisine ranks among the finest in the world, whereas Shanghai cuisine ranks among the finest in China. In Shanghai you’ll find highly regarded restaurants featuring the cuisines of Beijing, Guangdong, Sichuan, Jiangsu, Zhejiang, Hunan, Anhui and Fujian - eight celebrated styles of Chinese food. Available also in Shanghai are a number of restaurants featuring international cuisines, as well as vegetarian restaurants serving dishes made with only vegetables and bean products. The Shanghai Old Restaurant is a hundred-year-old establishment in the local Shanghai culinary style. Freshwater fish is the strength of this restaurant, whose menu features such delicacies as eight-treasure duck, red-cooked bullhead fish and braised meat preserved in fermented rice en casserole. Yangzhou Restaurant is famous in Shanghai for its Yangzhou-style dishes from the well-known Mu's Family Kitchen. Favorites include pork in jelly, stewed crab ovum with pork patties, Mu’s braised meat slices, and minced fish with pine nut kernels. Its famous pastries include lightly fried dumplings stuffed with scallion-flavored pork, and eight-treasure shaomai. Established in 1938, Meilongzhen is a renowned restaurant characterized by its Sichuan dishes prepared in the Shanghai style. Specialties include braised prawns, egg plants in fermented bean sauce, ginkgo nuts cooked with shrimp meat, and double‑cooked pork sandwiches. Lubolang is Shanghai's most famous pastry shop selling dozens of light refreshments in both Shanghai and Lake Taihu pleasure-boat styles. These include steamed buns stuffed with mushrooms and vegetables, stuffed buns with three kinds of sliced meat and vegetables, pyramid-shaped dumpling of glutinous rice and ham wrapped in reed leaves, and flaky cakes stuffed with jujube paste. The largest of its kind in the Far East, the Blue Sky Rotating Restaurant changes its menu on a monthly basis to feature special dishes from Japan, Southeast Asia, Europe and the Americas. One of the well-known vegetarian restaurants in Shanghai, Juelin serves such special dishes as minced fish braised with wolf-berries, imitation duck meat and ham. Known as “king of crabs and ancestor of wine”, Wangbaohe Restaurant was established in 1744 and gradually rose to fame for its service of old and mellow rice wine from Shaoxing, Zhejiang Province. Freshwater crabs are a very popular dish in this restaurant. 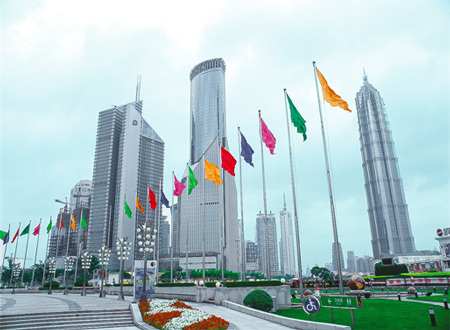 Shanghai is hailed as the "Shopping Paradise" and "Oriental Paris". So if you come to the city, shopping should not be missed any more than its other charming attractions. Providing the very best of shopping has become an indispensable part of the city's tourism industry. Specialties are calligraphy and paintings, watercolor wood-block printing, and seal carvings. Specialties are tea, traditional Chinese and Western pharmaceuticals, jewelry and antiques, traditional Chinese stationery, paintings and calligraphy, ivory, jade and wooden carvings, pottery, carpets and rugs, enamelware, silks and woolen fabrics, embroidered garments and table cloths, leather clothing, cashmere products, etc. The five-kilometer-long Nanjing Road, busiest and most prosperous shopping street in Shanghai, accommodates an average of one million shoppers and visitors every day. Nos. 1 and 10 Department Stores, Shanghai's largest of their kind, are situated here along with the largest food store. The other commercial giants include the Shanghai Fashion Company, Hualian Shopping Tower, New World Co. Ltd., and Luxury Goods Store. The road is also lined on both sides with a good assortment of specialty shops, more than sixty restaurants in varying culinary styles, and recreational and entertainment centers. No. 1 Yaohan Co. Ltd., a multi‑functional establishment complete with shops, entertainment centers, restaurants and offices, is by far Asia's largest international shopping center. The building stands 99.9 meters tall and covers a total floor-space of 144,837 square meters. The mall sells top‑of‑the‑line commodities including brand-name garments, luxury wristwatches, writing instruments, and cigarette lighters. Situated in the heart of the Nanjing Road shopping area, the Antique Branch of Shanghai Friendship Store caters especially to foreign tourists, overseas Chinese and compatriots fro Hong Kong, Macau and Taiwan. On sale in this store are various antique arts and crafts, ceramics, pearls, jewelry, jade carvings and bronze ware. Situated in the Shanghai Exhibition Center, the Arts and Crafts and Exhibitions and Fairs Company is by far China's largest shopping center of arts and crafts and tourist souvenirs. With a total floor‑space of more than 20,000 square meters, the Friendship Mall is a modern commercial center which sells nearly 40,000 commodities. It is fast emerging as a trend-setter in Shanghai. American barbecue, Italian pizza, and Chaozhou cuisine are featured in the restaurants situated on the fourth floor. Shanghai has two airports, Pudong, located 55 km from the city center, and Hongqiao, 15 km from the city center. Both are international airports, however Pudong handles most of the international flights and Hongqiao most of the domestic flights. There are connections from Shanghai to most major world cities as well as most other cities in China. Shanghai is at the center of an important rail network and there are daily trains to Beijing (12 hours), and most other provincial capitals. There is also a train to Kowloon in Hong Kong (26 hours). Shanghai boasts the most established highway system in China. Expressways have been constructed to link all the nearby provinces. The main long distance bus station is near the train station on Qiujiang Road. Via ship is a nice way to arrive or depart the city. Major ocean-going cruiselines stop in Shanghai, and some of the Three Gorges boat trips end here as well. In addition, there are good ferry services to some of the neighboring Chinese cities. The main passenger port is on Zhongshan Road South, 1 km south of The Bund. Within Shanghai, the most convenient way to get around for the foreign traveler is a combination of the subway, and using the over 50,000 taxis in the city. Shanghai also boasts an extensive bus network.